A cross between two classic desserts, Lemon Meringue Pie and Pumpkin Pie, this Lemon Pumpkin Meringue Pie will surely add an extra oomph to your Thanksgiving Dinner. Here is an easy Thanksgiving dessert recipe with a citrusy twist. Heat the oven to 325 F. Set the pan of unbaked pie crust on a rimmed baking sheet. In a medium bowl, beat together brown sugar, salt, 1 whole egg, 4 egg yolks (reserve the whites for later), pumpkin pie spice, pumpkin puree, cream, lemon zest and orange zest until smooth. Pour mixture into the prepared pie crust and transfer to the oven to bake for 40 to 50 minutes, or until the center of the pie is just barely set. Remove from the oven and increase the temperature to 425 F.
To make the meringue, combine the 4 reserved egg whites with the cream of tartar in a large bowl. Make sure that the egg whites are free from any trace of yolk and that the bowl is immaculately clean. Use an electric mixer fitted with the whisk attachment to beat on medium-high until foamy. Add the sugar, 1 tablespoon at a time, while continuing to beat. Once the sugar is all incorporated, beat until stiff and shiny peaks form, about 6 to 7 minutes. Dollop the meringue on the top of the cooked pie, completely covering the surface, swirling to make peaks. 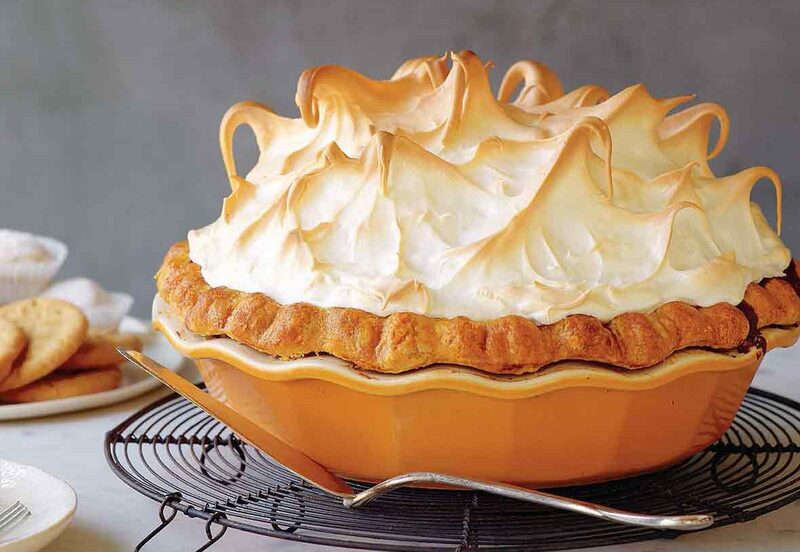 Return the pie to the oven and cook for another 8 to 10 minutes, or until the meringue is lightly browned. Allow to cool at room temperature before serving.